Cinnamon dusted apple and banana muffins! open just a week ago or the home baker who does such a good job ‘it’s like you made it yourself’. I’ve found that a cake that sinks in the center after what seems like six hundred hours of weighing, fidgeting with oven nobs and marking all sorts of religious symbols in the batter has a direct co relation to my confidence. Only with cakes. Pies, quiches, tarts instill no such fear. It’s not that I haven’t successfully baked a cake, it’s just the ghosts of sticky toothpicks past!! So to get over this fear of baking and revel in what I truly believe is actually just chemistry, I’ve put together a muffin recipe that—- is just too hard to stuff up!! Hopefully all of you out there who share the same apprehensions about baking will love it and feel really accomplished once you see these gorgeous burnished, risen and beautifully cracked muffins staring at you hot of the oven. The recipe is for a banana apple muffin. But you could use all banana or all apple or any moderately pulpy fruit of your choice. And the best part is… no finicky 245.6 gm irritating measures. Just get a coffee mug of your choice and follow me! 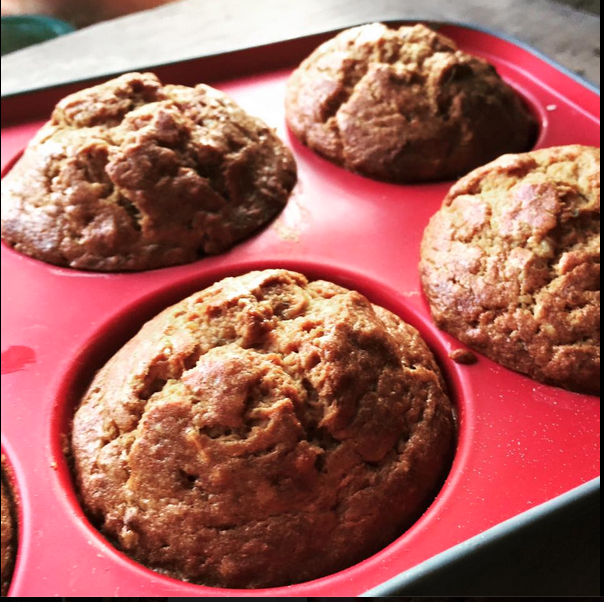 Banana/ Apple muffins- a recipe too easy to mess up! In a large bowl, combine butter and sugar. Whisk till smooth and creamy. Mash the bananas and puree the apples. Add the egg and milk mixture, vanilla, nuts and cinnamon to the fruits and combine well. Mix the flour with baking soda. Combine dry and wet ingredients by folding. Do not over mix as this will lead to a rather stiff batter. Some if not all the lumps should disappear when you mix. Pour into buttered muffin moulds and bake for 35-40 minutes or till a toothpick inserted comes out clean. Cool on a wire rack and devour. Or frost with an icing of your choice/ dust with cinnamon sugar and devour!